ATLANTA (CNN) -- "I probably have a little every day, because I think it makes you feel good when you get some." Those are the words of a chocolate lover. Those sweet desires are not just imagined. Now, researchers have found that eating chocolate, the number one food craved by American women, causes the brain to release endorphins, chemicals that make us feel good. "So we eat chocolate so we release and experience pleasure and so as a result, we crave chocolate,Ó said Adam Drewnowski of the University of Michigan. "We want chocolate in times of stress, anxiety, pain and so on. Chocolate is a natural analgesic, or pain killer." Other researchers have also said chocolate contains substances that might mimic the effects of marijuana, boosting the pleasure you get from eating the stuff. The ingredients might make the texture, smell and flavor of chocolate more enjoyable and combine with other ingredients like caffeine to make a person feel good, researcher Daniele Piomelli speculated. "We are talking about something much, much, much, much milder than a high," said Piomelli, a researcher at the Neurosciences Institute of San Diego. He reported the work with colleagues in the journal Nature. But a researcher who studies the brain chemistry of marijuana said chocolate contains such low levels of the ingredients Piomelli identified that he doubts they have any effect. Piomelli found that chocolate contains anandamide, which is also produced naturally in the brain and which activates the same target that marijuana does. He also found two chocolate ingredients that inhibit the natural breakdown of anandamide, which could lead to heightened levels of anandamide in the brain. "It's Mother Nature's solution via food cravings to try to elevate those chemicals, help us feel better and to function more efficiently," said Deborah Waterhouse, author of "Why Women Need Chocolate." "We will crave chocolate or some other food that has sugar and fat to help bring those chemicals back into balance." 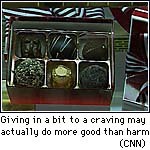 Fortunately, there is a sweet solution for those chronic cravings -- feed them. "Having chocolate cravings is something that's induced by stress and probably is governed by body chemistry -- so it's not something you can control," Drewnowski said. "They only become a problem when the amount consumed is too big. Otherwise, I say, no problem, enjoy and buy the best chocolate imaginable." The trick is to give in only a bit. "The equivalent of a half ounce, which is about a third of a candy bar, or a couple of Hershey Kisses will do it," Waterhouse said. "It's a surprising small amount."